I accidentally deleted my swap partition via gparted. (I'm still logged in the system so restoring should be easier) Can someone help me please? I'm not sure how to configure it because the Ubuntu installation did it automatically. 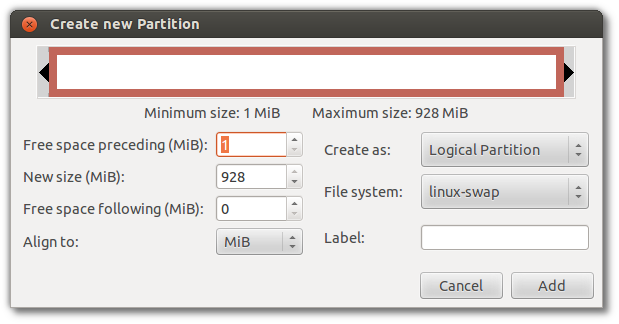 Just use gparted again to create the additional /dev/sda4 partition, and format it as type "linux swap". Unless you removed it, the swap entry in /etc/fstab should still be there. If you do not see such a line, obtain the UUID using sudo blkid | grep swap, and add a line in this format to /etc/fstab. Run free -m to verify the swap partition is active. Not the answer you're looking for? Browse other questions tagged partitioning gparted swap or ask your own question. Can swap be on a different disk? How can I expand a partition into non adjacent free space using GParted? How to use existing partition in preseeded installation?